I had another nightmare. I woke up with tears in my eyes. Frantic, heart-pounding. I remembered this so clearly. The abandonment I felt. Helpless…totally alone. I walked in through a door. It looked like a bank. A group of people were inside and a man followed me in. I heard the music. Dark and foreboding. I’ve heard this before. It seemed to signal impending doom. I watched the people moving in slow motion. They didn’t seem to notice what I noticed. The man seemed strange, suspicious. I watched his body language and he had nothing to do. Aimless in his actions, yet again, no one seemed to notice, but me. The man suspiciously moving toward a line, as if to do something, and then he leaves. All of a sudden, I look up and everyone is walking out in a hurried manner. No on is speaking to me. I am panicking. I’m asking what is happening. No one is speaking. They just have terrified looks on their faces, as they exit the door, and I’m trying to move forward but I feel I’m running in water.No one hears me. Finally, a woman looks at me and says, “we’re in danger! Leave the building!” I am at once terrified and lost. I cannot get to the exit as everyone is already gone. I am struck by a feeling of utter abandonment and wonder why I have been left behind. Why is it that I always seem to sound the alarm, yet I am the one that is ignored? Does what I have to say or do really matter? Should I just go with the flow? Stop swimming against the current. I’m getting beaten up constantly. As I’m running,I am also thinking does anyone know I’m here? I think I’m invisible. I was told in a recent report that I was “moralizing.” Perhaps I should just start becoming more immoral and blending. Then I won’t be left behind. All of a sudden, the people turn around and start to return. I don’t understand this. The woman says that the danger has passed. Wow, I guess I’ve dodged another bullet. Perhaps the real danger was outside all along. I realize as I wake from this nightmare that I have been crying. I have a deep pain inside of me, as I know I never made it to the door and I still wonder if anyone realized this. I felt this in the bombing I was in a few years ago. I wondered about my life then and if it was important. How many times I’ve relived this moment. I ran down the streets and alarm gripped me as I thought of my family. I felt this panic, a few years later, when a man had threatened me. I felt overwhelmed and bullied. Helpless. Time and time again, this has happened. I didn’t know where to turn. I felt I was, running in water. The feeling of fear, and abandonment coming over me, as I was helpless to get out of my situation. I would call for help and no one could hear me. I’ve heard those words over and over again in my life. I’ve tried not to entertain them in my spirit. But the enemy of my soul, had planted those seeds in my soul as a child, and torments me with them in my dreams. Now I watch my mother and what she is going through and I wonder at the loneliness inside. I get so used to taking care of others, that I sometimes forget, there really isn’t anyone for me. As we discussed the tears I thought of the scriptures. 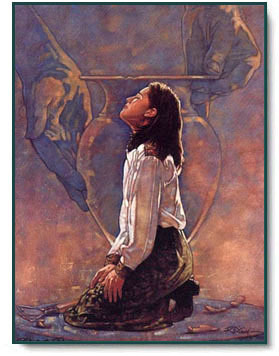 The Lord tells us that “He stores up all of our tears in a jar.” He also tells us that one day He will personally, “wipe every tear from our eyes.” This woman told me that in biblical days they had ‘Tear Bottles,’ and they would catch their tears and save them. They considered them so priceless. She had purchased one when she was on her last trip to Israel,and I searched endlessly,but alas, I did not find one. I’m sure the Lord knows mine would have been over flowing by now. But, this is a beautiful picture to me. It was a sweet comment, and I certainly do believe that. I have prayed for that too, but it hasn’t happened. I told her, “It’s not that I want sympathy or anything. I don’t. I have accepted some things in my life. She also told me that the flight attendants would buy every one of my books. So already, I’d be ahead of my flight attendant salary! I laughed. This is when I must have dredged up all the feelings that I had, of my present troubles, and the new drama unfolding. The realization, that I am by myself, as I face this battle. Oh, I know I always have the Lord as my protector and my guide, but there must be a reason for this. If it is to make me strong, well then, who am I to question His purpose in the plan? He does see us, but we shall also see Him. What is it? Well we’re living in the times of darkness and we need to be on our guard. People do not even realize what’s happening. Megachurches cropping up all over and pastors tickling the ears of the members, afraid of losing the tithes. The danger of losing all the money supporting the growth and this is exactly what the Lord speaks about when He speaks to the churches in Revelation. The works instead of the real love for Him. The appearance instead of the service and the wealth instead of the regeneration. Jezebel, alive and well in the church and the church leaders that tolerate her fornications inside the church all because she is bringing in people who bring more money and growth. This spirit will be leading in ministries and teaching as well. This is the apostacy and it has no regeneration in a person at all. It’s obvious because she hasn’t changed one bit. She expects the Lord to come along to her way of thinking. Of course we know that Gods word does not change,He calls sin, sin, and now it has been brought into the church, in the name of the Lord and the church leaders have turned a blind eye and even set people into ministry ignoring these sins. It is one thing to do these things in the world, but now to be brought into the church, the Lord is burning in His anger. He knows Jezebel and she hides in her relgious works, thinking she cannot be seen. But she hates the prophets of God and this is why she enters the church The Lord will only deal with her for so long before He moves His hand of judgement. Because of this He speaks in Revelation, that she shall be cast upon a bed of suffering, and all who fornicate with her, shall also suffer with her. It is amazing to me, that she does not see it, yet when we are in the midst of our sin, and refuse to heed the voice of the Lord, our hearts become hardened. It is only when we refuse to repent, that we are allowed to suffer. And in Revelation, He tells us that He has allowed Jezebel more than enough time to repent and she refuses. So it’s apparent that He is speaking to the apostates in this portion of scripture. Those with the most hardened of hearts. We are living in those times. I see it in a most personal way in my life. With people who I know and in the churches as well. They think they are rich, yet they are poor. They say they must clean themselves of the most silly things, yet the most obvious sins against the Lord, go unchecked, as if He turns a blind eye, because they are so busy in the church, and He is so pleased with their works for Him. I say it again. The Lord does not need our works! He did it all at the cross! Anything more is our proclamation to Him that He didn’t do enough and that is blasphemy. When He said, “it is finished, He meant it. We have the privilege of being part of the process, but that’s all it is. He allows us as part of His creation, to be co-heirs with Him. But to assume that He needs our help is just plain ludicrous, and Satan, is always busy, trying to fill, mans heads with these lies, when we aren’t yet regenerated by the Holy Spirit. This is why the Lord tells us to be “filled by the Spirit of God, and keep the house swept clean, so that these unclean spirits, cannot enter in.” These are spirits of religion, that seek to keep us bound up in doing empty works. They will not get us into the kingdom of God. They are worthless. Only the blood of Christ have paved the way for us. Now accept it. It’s free. And stay filled with His Spirit and stay humble knowing we can’t earn anything. Be obedient unto Him and Him only. If it doesn’t line up with His word, reject it. Don’t try to make His word line up to your lifestyle. Make your life line up to His word. As His spirit lives in you, you will overcome. This is His power living in you. Read it and live it. This is how they will know you are sons of God. You will be filled with His love. Always remember the narrow way. The lesser part. The remnant.Many are called…few are chosen. We are but the clay, and He is the potter. Yes, all the suffering, the molding, the shaping and in the end the furnace of affliction This is to make us the end product, the finished piece of art that the Master has created. Yet during the whole process we ask, why? Why must I suffer so much? We don’t see it. We don’t see the end to the beginning, as the potter does. The creative process and know what only He has in store for this lump of clay. Am I to be a vessel of honor for His use? “Does the clay say to the potter, what are you making?”(Isaiah 45:9) Yet, we do this on a daily basis. But we must look and wonder at it all in amazement as I am now. I am in the spiritual battle of my life and look at my past. Dreams that I had since I was quite young. Always knowing that I had a unique calling, yet not quite understanding it. I had an understanding of the end times before I ever read the words in scripture because of the dreams given to me and even in my own personal life. The darkness that I’ve been up against. It is not just an earthly fight we are in and it is a terribly difficult thing that most men will never understand. Some men will go through their lives with only a natural understanding of things, even though they have a spirit. They will never know how to war against these spirits. The battle has already been lost. Now I have been battling, and the Lord is my guide against these foul spirits and He has told me that an end will come soon. He will align me with someone that will represent Himself. A picture of David in scripture. He was a picture of the Lord. A man that was not afraid of Goliath, although all of the warriors of Israel were afraid. I thought I had seen him many times but I was wrong. All of them afraid of the little dragon, pretending to roar.Some of them too arrogant to be the one chosen. One man was so arrogant and such a bully, that I knew he was the exact opposite of what God would have wanted in His plan. “God is opposed to the proud, but gives grace to the humble.” I always considered the choice of David in the plan and this man was immediately exempted. The one thing I know is that many men live out their lives and have fulfilling careers, they have reached the pinnacle of power, amassed great fortunes and fame, but only a small amount in this life can actually attest to the fact that they have fulfilled their destiny. Even when the Lord chose His disciples, He actually had chosen hundreds. (John 6:53) That’s right, a lot of people think about the 12, but they don’t know about all of them that left after thinking Jesus was a lunatic asking them to become cannibals.When He began speaking about the eating of His body and drinking of His blood, they immediately thought Him to be speaking in literal terms once again, rather than spiritual, which is where everyone seemed to get hung up. Jesus always spoke in spiritual terms when addressing people. This is what divided the masses and He was left with the remnant. No doubt this is what is being spoken about me and many other believers as the dark forces come against us. The fact of the matter is, “many are called, few are chosen.” As I said before and I will say it again, when I have made decisions in my life that all of the other sheep have not made, I always take the narrow road, the road that does not lead to destruction. You can choose to go the other way if you’d like, but I follow Christ. So if you want the narrow way, “imitate me as I imitate Christ.” It is the way that lead to eternal life. Yes, the enemy makes it seems as if it is destructive, for a short time, but his is the one that leads to destruction. Now, the Lord has spoken very clearly to me. I have all of His power behind me and the gates of hell shall not prevail against me. This is why the enemy is running scared. Whoever the Lord partners with me in my quest for truth, shall not fail. The hand of God is with him and they shall succeed at whatever they do. They will fulfill the destiny that God has mapped out for them because the Bible is a loop of history and I know my role and the role of the one who has been called. Of course the most important strategy of the enemy of your soul is that you never understand or realize your destiny. I have been knocking, seeking, and asking, and waiting patiently as the Lord waits to reveal who David is to me. I do know that when Samuel went to Jesse’s house to anoint him, he did not find him among any of his sons, but out with the sheep, doing the work of a true shepherd and this man will not look the part. As the Lord told Samuel, “Man looks at the outward appearance, but the Lord looks at the heart.” David was in the fields, getting his hands dirty, yet he was anointed to rule as king. He never flaunted his credentials. He spent time with the sheep, protecting them and later he did the same thing in the army and with the people. A true picture of Christ. Blessed is the one who answers the calling and destiny that the Lord has for his life! He will succeed in everything he does and the Lord will uncover everything that has been hidden and nothing can stand against him! He’s part of this plan to set the captives free!